How to handle tri-state checkbox in the batch editig? Grid provides an option edit the Boolean column using Checkbox. Usually, check/uncheck state was provided for editing functionality. 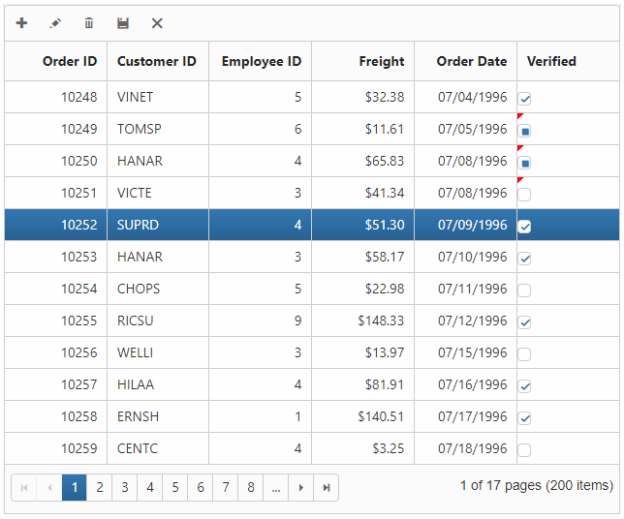 To handle the tristate in the checkbox, you have to use the EditTemplate feature of the Grid Columns. Using this ejCheckbox was rendered to handle the intermediate state along with the check/uncheck state. Follow the KB for handling the intermediate state of checkbox in the Batch Editing. Render the Grid with the EditTemplate to the respective Boolean column, QueryCellInfo and BeforeBatchSave event. Define the Create, Write and Read events of the EditTemplate to create/render/retrieve values from the ejCheckBox to the ejGrid. QueryCellInfo event defined to modify the Native Checkbox element to the ejCheckBox for displaying the intermediate state. BeforeBatchSave event used to set the Boolean values to the respective Boolean column.